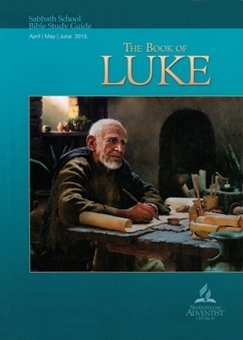 The lesson does a good job of introducing 'The Book of Luke' but it should be pointed out that it is normally known as 'The Gospel According To Luke' with it being one of four gospels that outlines the works or 'acts' of our Savior Jesus Christ during his earthly ministry that led to Calvary and the salvation of fallen sinners. Luke initially records the gospel account of the acts of Jesus which he then follows up with an account of 'The Acts Of The Apostles' where he is an eyewitness to much of what he records. Instead of focusing on the lesson introduction this is a good time to address the phrase, "keeping Sunday is not from the Bible", which is fundamental to the theme of this week's 'Inside Story, A Divine Encounter'. In Exodus 20 God is speaking to the Hebrew people from Mt. Sinai specifying the conditions of the covenant he makes between himself and them. The 'Ten Commandments' of this covenant was representative of all that the Jewish people agreed they would obey. If they did so they would be blessed. If they failed and refused to repent of their sins then there would be adverse consequences. Central to the Ten Commandments of this covenant was to remember and rest on the Sabbath Day. It was not given to them as the day they would be required to worship God. In the time of Jesus' ministry here on earth the question concerning worship was focused on where to worship God, not when. For further reference read Hebrews chapter four and understand that 'Today' is the time to find rest in the person and work of Jesus Christ. Rest is no longer about a certain day. Worship never was about a certain day. In the Old Covenant God made with Israel 'keeping the Sabbath Day holy' was all about resting in the promises and blessings of God. Under the Old Covenant in the time of the Lord's ministry on earth, the question concerning worship was about where to worship God, not when to worship. In the New Covenant that Christians now live under true worshipers do so "in spirit and truth". Orthodox Christians rest in the work and person of their Savior Jesus Christ ongoing continually which is not about resting on a certain day. Therefore, there is no such thing as "Sunday Keepers" that compares to 'keeping' (resting) on the Sabbath as was done under the conditions of the Old Covenant. Day Two, Sunday, March 29: "An Orderly Account"
"Luke, an inspired author of Scripture, used other material in his writings. Very interesting! Obviously, that use of other sources doesn’t negate the inspiration or authority of what he wrote. What lessons should that have for us as Seventh-day Adventists regarding the question of how inspiration, either canonical or noncanonical, works on inspired writers?" The lesson author is attempting to justify the writings of Ellen G. White on the grounds that since Luke used sources other than his own direct observations in writing the Gospel of Luke then so can she. However, before this implied comparison can be considered valid her recorded words must be subjected to the same strict rules of what is canon as that of Luke's written works which have been included in Scripture. We must be very clear on what is or is not canon according to the definition we find in Scripture, the understood truthful inspired word of God, the Holy Bible. In that way we can test the written works of Ellen G. White against the biblical standard or what is or is not the inspired revelations of God. Written by a recognized prophet or apostle. Written by those associated with recognized prophet or apostle. Truthfulness: If anything is found to be not true in the writing it is rejected as not from God. Faithfulness to previously accepted canonical writings. Confirmed by Christ, prophet or apostle. With reference to the early church: is it accepted church usage and recognition. Either the Ten Commandments, 'Sabbath Keeping' and the rest of the Old Covenant law were nailed to the cross or they were not. Which are you going to believe, Scripture or Ellen G. White? Does she or does she not violate the biblically founded rules of what has been included in Scripture? Luke's writings pass the test of what is canon and therefore have been accepted as Scripture. Ellen White's writings, among the many other issues of authenticity, contradict Scripture. Therefore they are not canon nor can they even be considered non-canonical inspired revelations of God. Since the writings of Ellen G. White fail on point #3 they cannot possibly pass muster on the other points of what is canon. Day Three, Monday, March 30: "Call His Name John"
"The birth stories of John and Jesus have parallels. Both are miracles: in the case of John, Elizabeth had gone well past the child-bearing age; in the case of Jesus, a virgin was to bear the child. The angel Gabriel announced both birth promises. Both announcements were received in a spirit of wonder, joy, and surrender to God’s will. Both babies were to grow and become strong in the Spirit (Luke 1:80, 2:40)." Since God is spirit and God created mankind in his own image (John 4:24 & Gen. 1:27) then it follows that Adam and Eve were both created with a living human spirit patterned after the image of God. Also keep in mind that on the day they sinned they died, Gen. 2:16 & 17. Since they did die on the day they sinned yet lived with physical life for many years afterwards it could only have been their spirit that died on that day. Therefore, in the case of John the Baptist, the correct rendering of Luke 1:80 is that his own human spirit (lower case 's') is that which became strong. The lesson is wrong to render his spirit as Spirit because upper case 'S' refers to the Holy Spirit. In contrast, John the Baptist like all other sinners needed more than just to have his sins atoned for. His dead spirit he was born with needed to be 'born again' (brought to life and grow) in order for him to be in the kingdom of God, John 3:1-16. While the birth of John the Baptist and the birth of Jesus Christ were both miracles there are vastly more differences than commonalties in their conception, birth and lives. John the Baptist was born with a dead spirit that grew via the Holy Spirit whereas Jesus Christ was always one with the Father and the Holy Spirit. While Jesus was said to have grown in wisdom Scripture doesn't say he grew in the spirit. We can conclude that it was his perfect humanity that grew in wisdom. John the Baptist had a sin nature in need of atonement in the very same way as that of all other sinners. Jesus Christ qualification as our Redeemer is because even in his humanity he was without sin. Day Four, Tuesday, March 31: "Call His Name Jesus"
The lesson focuses on the name of "Jesus" which, of course, is simply an English word which means 'Savior' or Messiah and is the one promised in Gen. 3:15 for the redemption of mankind. The Angel Gabriel was announcing to the virgin Mary that she would have a son (which should have been rendered with a lower case 's') via the Holy Spirit who would come upon her. A lower case 's' leaves open the possibility that her and Joseph would have other children. This rendering is where heresy could enter in because of the possibility that it implies God has other sons unless you consider the next verse. Luke 1:32 clarifies to her that this one unique child of hers would be the Son (upper case 'S') of God. 'A son' that Mary would give birth to is in reference what was happening to Mary whereas verse 32 tells us this son of hers would uniquely be 'the (only) Son' of God. For those familiar with Adventist theology you are aware that Ellen G. White said Jesus was once known as Michael the Archangel (EGW, Prophets and Kings, P. 572). Therefore we need to be very careful to read verses such as Luke 1:31 within their surrounding context and compare other reliable translations as needed to gain a clearer understanding of the original text that has been translated into English. Jesus Christ, the Creator and eternally existing Word whom Mary gave birth to is the 'only Son from the Father'. Jesus, who is now seated at the side of the Father, is called "God" in verse eighteen. Jesus was seated at the side of the Father at the time John wrote this gospel. See also Heb. 1:6 were Jesus is also said to be seated at the side of the Father. Jesus is begotten and worshiped by the angels "when he (the Father) brings the firstborn into the world". Jesus, as the Creator of all that was created existed before the beginning of time. Since only God (Father, Son and the Holy Spirit) have eternally existed before the beginning of time all other persons have been created including Lucifer who is now known as Satan. Only Jesus Christ is said to be the begotten Son of God which is to say Jesus was never the brother of Lucifer. To said so is heresy as that would be a denial of Jesus' full divinity. When the lesson quoted Luke 1:31 from the NKJV it should have included verse 32 to clarify that the son born to Mary was the one and only eternally existing Son of God. God singled out Mary for reasons of his own choosing. We can gather from the context of what Scripture does say that both Mary and Joseph were righteous in the sight of God which is consistent with their humility. There is nothing in either Luke 2:7 or Phil. 2:5-8 to suggest that Joseph and Mary were parents living in poverty. Humble yes, but living in poverty no. Jesus was born in a manger simply because there was no other choice that his earthly parents could have made. Since God foreknows all things this speaks more of the character of God than the perceived poverty of Joseph and Mary. Another important issue when God chose Mary to be the mother of Jesus was the fulfillment of some of the many prophecies concerning the coming Jewish Messiah. The genealogies of Mary's first born son, Matt. 1:1-17 & Luke 3:23-38, show that Gen. 3:15 was fulfilled at Calvary which said "he shall bruise your head, and you shall bruise his heel". Jeremiah 23:5-6 was fulfilled because Jesus was born in the line of King David. The biblical record states that the reason Jesus was born in a manger during this time of the required census was because there was no other room in the town of Bethlehem for Joseph and his family. Scripture does not say they couldn't afford something more suitable while in Bethlehem nor that they were living in poverty. God chose Mary because she found favor in his sight, Luke 1:27. Since she was betrothed to Joseph at this time God's favor must have encompassed him also. From the context of the gospel accounts of the conception and birth of Jesus God's favor was founded upon their humility and righteousness in his sight. This is totally unrelated to their social status or whether they were rich or poor. We learn that at least two of the many prophecies concerning the Messiah were fulfilled by Jesus' genealogy, Gen. 3:15 & Jer. 23:5-6, when God choose Mary to be the mother of Jesus. According to Luke 2:30 where Simeon was addressing God, he said "...for my eyes have seen your salvation". This is far different from saying what the lesson says, that "salvation is through Jesus" unless you intend to mean through Jesus alone with none of your own works included. Jesus alone, because of his complete finished atoning work at Calvary is our salvation. The angel of Rev. 14:6 & 7 speaks of 'an eternal gospel' to be proclaimed to all peoples. Since the eternal gospel is about the salvation of all sinners and Jesus alone is our salvation we need to understand how he is and always has been our salvation. Jesus Christ himself is the foundation of the Christian faith. Because of the gospel message of what he did at Calvary (his death, burial and resurrection) Jesus Christ alone is the author and finisher of our salvation. Another caution that must be made concerns Simeon's words "a light for revelation to the Gentiles". Certainly, salvation is for all peoples, not just the Jews. However, we must not forget that the New Covenant Jesus made was made with Israel. Gentiles are grafted into this covenant but do not replace Israel or what God has promised uniquely for and to them. The Old Covenant is a broken covenant which has been replaced with a New Covenant. Jesus Christ is the author and finisher of our salvation. As Simeon said while holding the baby Jesus in his arms, "my eyes have seen your salvation". The 'eternal gospel' of Rev. 14:6 & 7 is the complete finished gospel centered on the death, burial and resurrection of Jesus Christ at Calvary. Anything else added cannot be the gospel because Jesus himself, and only himself, is our salvation. While we Gentiles sinners have been 'graphed into' the New Covenant and receive salvation in the same way as Jewish sinners, this covenant centered on Jesus and Calvary was made with Israel, not us Gentiles. The replacement theology being taught by many including Adventist is false. God has not utterly abandoned or replaced the people and nation of Israel. In one of the discussion questions it is asked, "How does inspiration work?" and then asks us to see Ellen G. White's book; “The Inspiration of the Prophetic Writers,” Selected Messages, book 1, pp. 15–23. When God breathed life into Adam what he did was a perfect work. In the same way when God 'breathed out' Scripture it also was a perfect work of God not "diffused" by the frailties of God's chosen writer's of the Word of God. Note well what the prophet Balaam said. While Balaam was a person who may have wished to do otherwise, Balaam was a prophet of God and even he could not say anything other than exactly what God gave him to say. How can Ellen White dare say inspired prophets of God say or record the inspire word of God in any way less than exactly what was given to them to say? God perfectly accounts for the uniqueness of the prophet. Prophecy is never by the will of man. It is totally God's will. The Apostle Peter declares men spoke from God as they were carried along by the Holy Spirit. This means all Scripture is a work of God not diffused by the will of man. Ellen G. White is wrong. The divine mind is not diffused in Scripture. Furthermore, she fails Point #4 of the test of canon which has to do with faithfulness to previously accepted canonical writings. Namely, she contradicts Scripture. Copyright 2015 BibleStudiesForAdventists.com. All rights reserved. Revised April 6, 2015. This website is published by Life Assurance Ministries, Camp Verde, Arizona, USA, the publisher of Proclamation! Magazine. Contact email: BibleStudiesForAdventists@gmail.com.